Israeli colonizers attacked, Tuesday, a Palestinian farmer while plowing his land in Burin village, southwest of the northern West Bank city of Nablus. The assailants came from Yitzhar adjacent illegal colony, which was built on illegally-confiscated Palestinian lands. They hurled stones at Mohammad Hasan Najjar, inflicting various cuts and bruises, in addition to causing damage to his tractor. 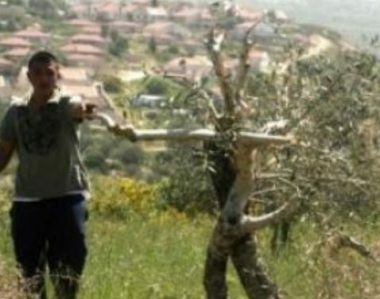 Furthermore, Israeli colonizers from Elon Moreh illegal outpost, invaded nearby Palestinian orchards in Deir al-Hatab village, east of Nablus, and cut many olive trees. On Tuesday at dawn, the soldiers abducted at least twelve Palestinians, and injured one, during massive invasions in several parts of the occupied West Bank, the Palestinian Prisoners’ Society (PPS) has reported.